Are you an employee wanting to learn to sit and work more easily? Are you a manager wanting to improve the health & safety of your staff? Do you want your team to experience less aches & pains in the workplace? Then the Feldenkrais Method® may be the solution for you and your team. The Feldenkrais® approach is unique in the way that it assists individuals improve their functioning across all aspects of their life, including sitting at a desk, using a computer, and other workplace activities ranging from office work through to some more physical types of work. At Movewell Livewell® we offer tailored workplace programmes utilising the Feldenkrais® approach. Programmes can include a combination of individual sessions and group lessons. These are held on-site at your business premises, and are focused on improving individuals functioning in their office and workplace. Here’s what one of our clients said about how he learnt to sit properly and be pain-free. Individual sessions are tailored to an individual’s specific needs and are particularly effective for staff with long-standing or chronic issues. This includes an assessment of how a staff member functions in their work setting including how they use a computer and other devices, and how they work in sitting or standing at their desk. Alan will help the staff member discover their particular work patterns and guide them into learning new, stress-free movement habits. The way they function in their work, e.g. how they currently use their shoulders, arms, back, neck and eyes. How they sit and work at their desk/work station. How the different parts of their body are inter-connected, e.g. how eyes affect the range of movement of their head and shoulders. How muscles move their bones (the body’s support structure), whether it is: sitting or standing at a desk, using a smartphone, computer or any other electronic device; or simply just reading and thinking. Most importantly, all participants will be introduced to learning more efficient movement patterns, which improve the way they move and use their whole body. We recommend group lessons be done on consecutive weeks to properly embed the learning. Lessons are normally 40 minutes long and can be provided in work time or over the lunch hour. All participants will also receive additional material to reinforce their learning. A happier and healthier workforce (through reduced stress and tiredness). A more productive workplace (from better thinking and focus). 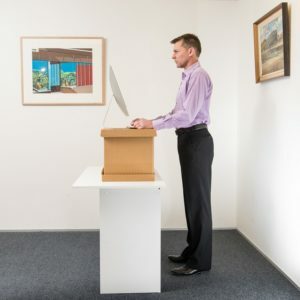 Staff using more efficient movement patterns, improving the functioning of their whole body; consequently staff experiencing less stress and strain when undertaking their work. Reduced staff absenteeism – contributing to reduced operational costs. Staff acquiring new strategies and tools that they can apply to improve the way they function/move, both inside and outside of the workplace. Compliance with health and safety obligations. At Movewell Livewell® we are focused on helping individuals improve their health and wellbeing across all aspects of their life. And this includes assisting individuals in their workplace. As part of our services we offer on-site workplace programmes fully tailored to your workplace and your requirements. If you would like to learn more about the Feldenkrais Method®, and how it can you’re your workplace then please give me a call. I offer a free, no obligation, 1 hour consultation. In this free consultation I will explain how the Feldenkrais Method® can be applied to your particular workplace.